After ten years at the helm of the Paranormal Review, Dr Nicola Holt is stepping down to spend more time with her family. But because she is not a politician, she really is going to be spending more time with her family – one which has recently increased in size. I am sure you will all join me in congratulating her on the birth of Daisy, as well as thanking her for all that she has done for the Review. You will, no doubt, note a few changes around the magazine and I hope that you will all bear with me as I settle into my new post. 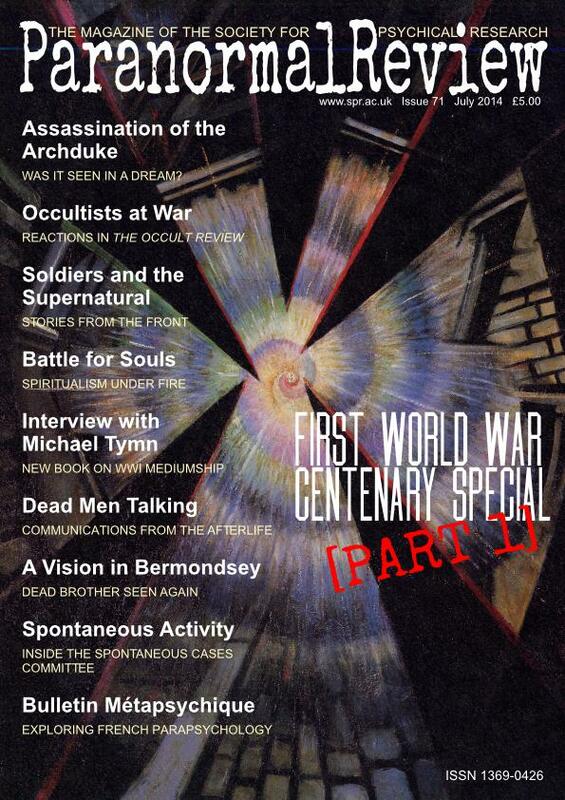 As this year is the hundreth anniversary of the First World War, which regrettably was not the war to end all wars, I am going to be marking the occasion with two special issues on the subject, suitably enough, of WWI and the paranormal. The response to my call for papers has been tremendous and I am delighted to introduce some new authors to the magazine whose contributions I am sure you will find as fascinating as I have done. Prof. Mulacz examines the event that started it all off, the assassination of Archduke Franz Ferdinand, with consideration of a possibly precognitive dream and the stacking up of coincidences that put victim and assassin in the same place at the same time. Dr Alison Butler has drawn on the war issues of the Occult Review to build a fascinating picture of the discussions, theories, predictions of Britain’s occultists. With so many young men dying in all those corners of a ‘foreign field’, Spritiualism found itself having to meet a new demand for news of the other side. What is not often appreciated is the extent to which traditional Christian faith saw this as a challenge and Dr Francis Young details the reaction of the Catholic and Protestant Churches. Lucy Harris looks at the beliefs, often labelled as superstitious, of the soldiers at the front. Michael Tymn tells us about his new book, Dead Men Talking, featuring contemporary accounts of purported communication with soldiers killed in action, and publishers White Crow have kindly provided us with an excerpt. As a nice little anomaly of my own, a patriotic WWI postcard fell out of an old copy of an Asterix comic (in German) in my wife’s library as we moved some books. It says ‘For King and Empire’ over a portrait of Lord Kitchener. On the back, a certain Boyce of Battersea Park writes in French to a lady in Paris, dated 29 December 1916. My wife had not bought it. None of us know where it came from, but there it is. For some time, the Paranormal Review has had full colour covers, providing the opportunity for something more eye-catching on the front. However, choosing an image was a challenge. In looking through old photographs, contemporary painting and the propaganda posters of the period, one is struck by the extreme contrast between the initial enthusiasm for the war and sense of patriotic duty that motivated the volunteers, and the utter horror of the new industrialised battlefield. Pride and sorrow for such bravery and waste catch in the throat like poison gas. Added to that is the additional difficulty of finding something touching upon what we could call the ‘paranormal’. In such alien landscapes of unimaginable carnage, one hardly needs to seek for that which was beyond the ‘normal’. Then simply getting hold of a high-quality image of such illustrations of the paranormal as there are turned into a wild goose chase. In the end, I chose Futurist C.R.W. Nevinson's Bursting Shell (1915); a cyclone of exploding light shattering the darkness of some war-torn town with the terrible mystery of modern warfare. Thankfully, it is not all doom and gloom. Alan Murdie introduces us to the work of the SPR’s Spontaneous Cases Committee. Dr Renaud Evrard presents on overview of the IMI’s important periodical, the Bulletin Métapsychique. And to wrap up, we have the latest line-up for this year's SPR conference. Finally, the Paranormal Review bills itself as the magazine of the SPR. What does that mean? What should it mean? You are the Society. Send me your suggestions, news items, letters, accounts of personal experiences, articles, photographs, etc. Take part in this magazine and make it your own, and together we may make some astounding discoveries. Prof. Peter Mulacz considers a possible premonition of the assassination of Archduke Ferdinand and the tragic consequences of a set of unlikely coincidences that lit the fuse that was to set Europe alight with war. Dr Alison Butler presents the First World War as it was seen in the pages of The Occult Review, including Aleister Crowley's prediction of war. Lucy Harris takes us into the hearts and souls of the soldiers on the front line with her examination of their beliefs and stories. The Roman Catholic Church led a campaign against Spiritualism during and after the First World War, as Dr Francis Young shows, but with some surprising consequences. Author Michael Tymn shares his thoughts on writing his latest book Dead Men Talking and considers the evidence for the afterlife. Publishers White Crow provide an extract from Michael Tymn's new book, Dead Men Talking, published this month. Following recent correspondence, Dr Leo Ruickbie writes up a previously unreported case of a 'vision' experienced during the First World War. Alan Murdie takes us inside the SPR's Spontaneous Cases Committee to share tales of poltergeists and hormones. Dr Renaud Evrard details the work of the Bulletin Métapsychique, the journal of the French Institut Métapsychique International. Short biographies of this issue's authors. Read the full line-up at this year's 38th International Annual SPR Conference at the University of York.